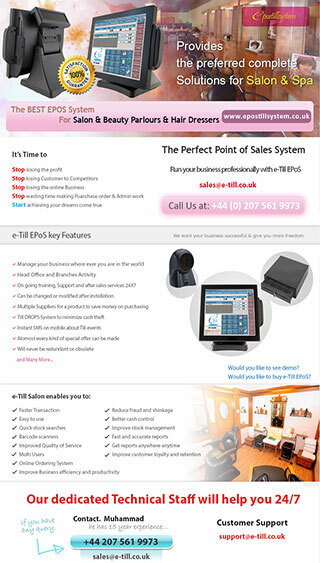 Salon Spa Till System has been developed in conjunction with some of London leading salons to ensure that the things that really matter in salon management are simple, easy to use and effective. Salon Spa Till System can vastly improve the customer experience in a salon. 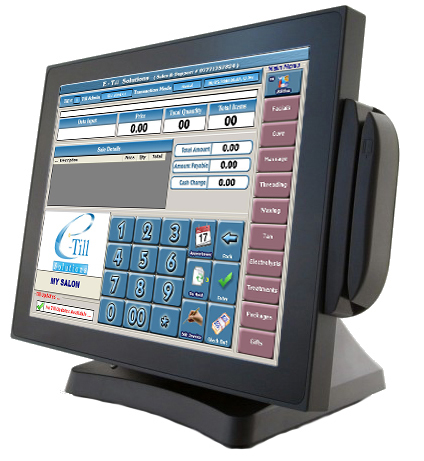 Salon Spa Till System provide business management, appointment calendar, scheduling and POS software for Hair Salons, Tanning Salons, Beauty Salons, Nail Salons & Massage Parlors. Many customers ask us, "What makes you better than your competitors?" When you get right down to it, almost all software designed for salons & spas will do the same basic things (sales, appointments, clients, employees, inventory, reports, etc.) So how do you decide what is best when they are all pretty much the same. Suitable for single terminal, multi terminal sites. Product Single Price, Course Price and Price Range can be defined. In Case of Course Price, Voucher for remaining courses will be printed to identify customer's next visit. In Case of Course Treatment, Customer can pay in parts. Gift Vouchers of any amount can be generated. Customer's Information will be stored against Gift Vouchers and Courses. Customer's can be searched by Phone, Post Code and Name to speed up next visit. Discount can be give on every product. Discount can be made Password Protected. Maximum Discount %age can be controlled. On Hold Customer, to serve customers quickly. Duplicate Invoice can be printed. Cash, Credit Card & Voucher Mix Payment Option Available. Cash, Credit Card & Vouchers Details provided on Reading. Till Drop System to Minimize Cash Theft. Till Float defined from Back Office. Instant SMS Messages Can be enabled on Z-Reading, Messages from Cashier to Admin and Till Paid Outs. Head Office and Branches Activity.